Phase 2 of The Pickstock Group’s student accommodation scheme is well on track for completion in August, ready for this September’s intake of students. Installation of the 398 room modules to Phase 2 will be complete by the end of this month, following a successful install programme executed by Elements Europe. As modules have been installed, Pickstock Construction has been working through each block, adhering to a careful and well planned programme to ensure work to the envelope of the building and its interior has followed on from the module installation in the most efficient manner. 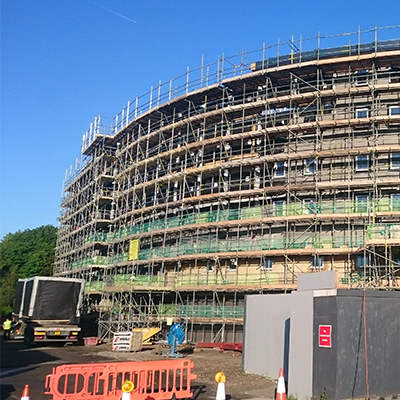 Bricklayers are now striving to complete the envelope of the building and internal works continues with first and second fix mechanical and electrical being completed where possible throughout the accommodation blocks. The site resides on the side of King Edwards Quay in Colchester, and work is now underway on the landscaping area on the quay side. Students will benefit from a landscaped communal outdoor area that features lawns, footpaths and seating areas overlooking the quay. The completion of Phase 2 will see the site fully finished. The project which is the largest student accommodation scheme to date for The Pickstock Group started in November 2013. Doors to Phase 1 of the scheme opened in September 2014 welcoming 381 students. This September will see a further 398 students move into Phase 2, bringing the total amount of student residing at the scheme named The Maltings to 779.